For those who appreciate the quieter Texicana, Americana this guy is an absolute treasure. A songwriter of rare quality and up there and beyond with Guy Clark. Luckily for the those of us in UK he makes what seems like an annual visit to these shores, playing small friendly venues. I suspect this is as a result of Bob Harris championing him early on and building a small fan-base. If you haven’t heard him, you can always check him out on his web site – easy peasy to find. His 4th cd “say grace” was issued last year – and it has been picking up some well deserved recognition – in the Top 5, Rolling Stone Country Lp’s of 2013! 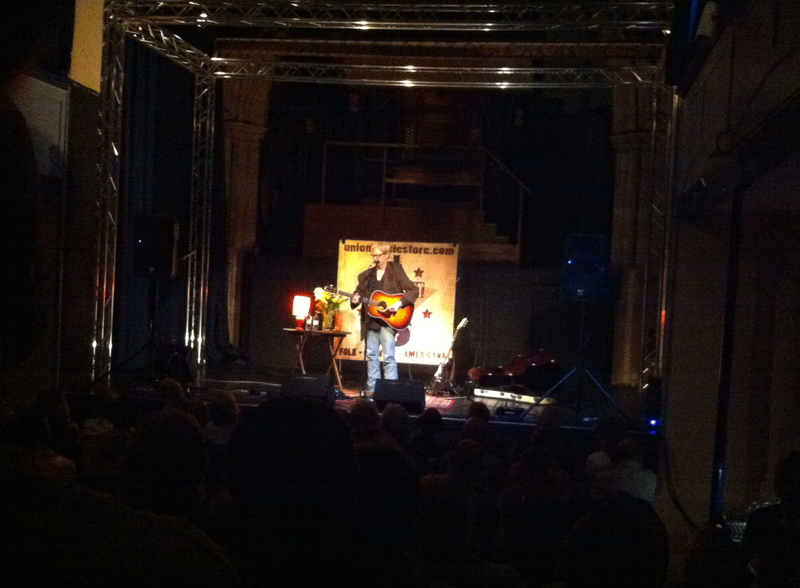 Anyway back to last night – Mr Baker could be found entertaining a good crowd in a lovely converted church in the historic Sussex town of Lewes. It was a new venue on me – and one I would be only too happy to visit again – similar but nicer than St George’s in Brighton. I belive Nic & Jo Jones are lined for All Saints later in the year. It was also an educational night – at one point the stage conversation meandered on to Virginia Woolf – who lived close to Lewes. At the height of a bout of depression she filled the pockets of her coat with stones, walked into the River Ouse and drowned – if you feel so inclined the words of her farewell can be found on the net and are astounding reading. Back to Sam – his songs give snapshots of life. Yet they have space to let your imagination breath – no polished po songs here. They often portray the sader side of life and I feel they sit closely with say Guy Clark’s Old No.1 songs and in some way remind me of the departed Warren Zevon (not sure why – but they do). Last night Sam opened up his soul further than I have heard him before on his experience of being blasted by a Train Bomb in Peru which killed the three travellers he was sitting next to – you cannot help but be moved – and it is a stark reminder of the madness of some of the human race who are just nasty pices of work (of which too many are hitting the headlines these days) and the damage they do. So yes it is Real modern Country Blues! 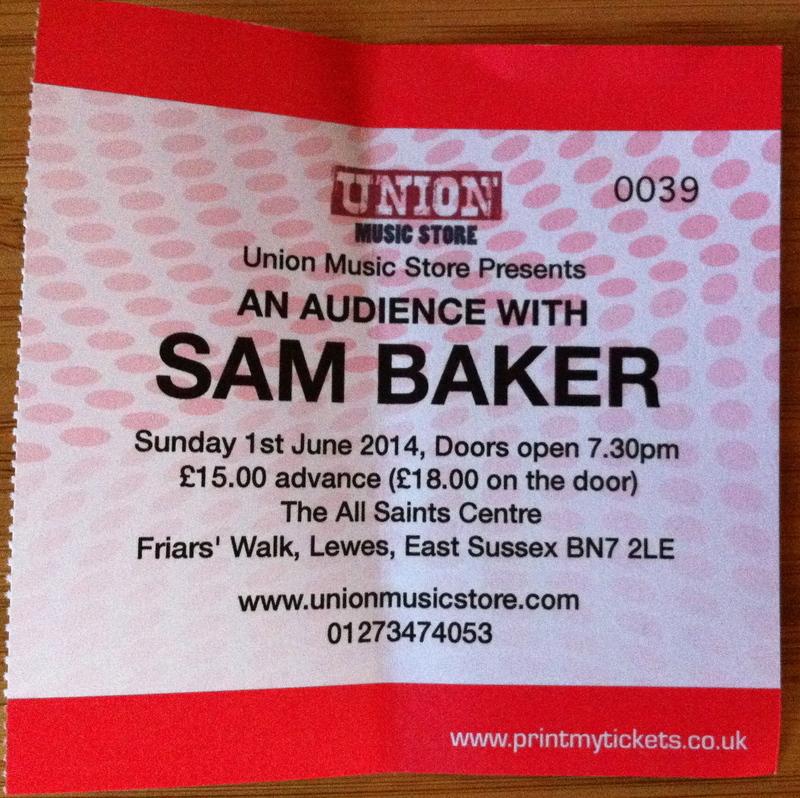 This entry was posted in Music and tagged Music, Sam Baker. Bookmark the permalink.